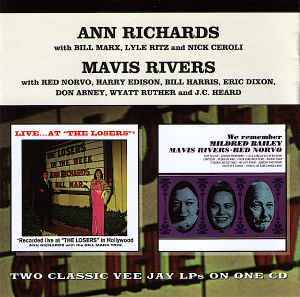 Ann Richards With The Bill Marx Trio "Live At The Losers"
Mavis Rivers / "We Remember Mildred Bailey"
This compilation © & ℗ 1997 by Blue Moon. Tracks 1 to 11 recorded live at "The Losers" in Hollywood, 1964 [sic]. Originally issued on Vee Jay LP Live At The Losers (SR 1070). Tracks 12 to 23 recorded at United Recording Studios, Las Vegas, December 8 & 9, 1964. Originally issued on Vee Jay LP We Remember Mildred Bailey (VJS 1132). NOTE: Track 23 is erroneously credited to Benton-Overstreet-Higgins-Garrison. The actual writers of this song are Billy Higgins and W. Benton Overstreet.